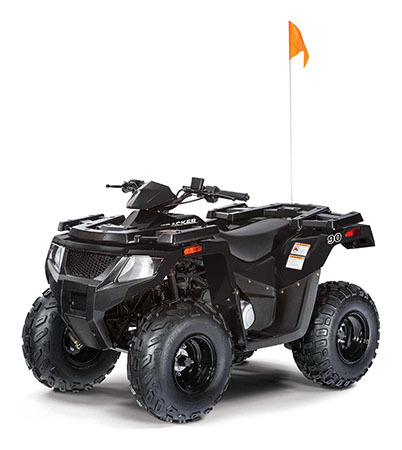 Young riders 12 and older will experience the quality and fun of a full-size ATV in this machine right-sized for them. Power is supplied by a 4-stroke, single overhead cam gas engine with a Duramatic automatic transmission, automatic choke and speed-limiting governor. The TRACKER 90 is full of spirit and ready to play! 90cc air-cooled, 4-stroke single overhead cam, gas engine. Automatic cvt transmissions with neutral and reverse. Self-cleaning rear hydraulic disc brakes. Parent adjustable throttle / speed limiting governor.